Daddy’s Grounded was started by Joel Gratcyk as a way of remembering the personal experiences of fatherhood in all its details, with photos, video and written thought. Joel lives with his family in the western suburbs of Chicago. He’s a craft beer enthusiast and a professional nerd. Joel has a four-year-old son referred to often on the blog as Mr. Dude who loves bright colors (especially pink), airplanes, books, playing outside and staying in hotels. He also welcomed a second son into the world in early 2017, Teddy. Joel’s been married for 12 years this April to his best friend, Abigail. 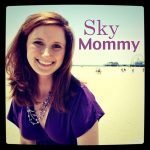 She is a flight attendant, an avid baby wearing advocate and Instagram power user. Beyond writing about his family and views on life Joel occasionally works with brands and organizations with whom he feels a connection. If he enjoys using their products or supporting their initiatives you can bet he’ll entertain ideas on how to partner with them on his blog or social channels. Joel hopes you enjoy following him on this journey at DaddysGrounded.com and that you’ll connect with him on Twitter, Facebook, LinkedIn, and Instagram.